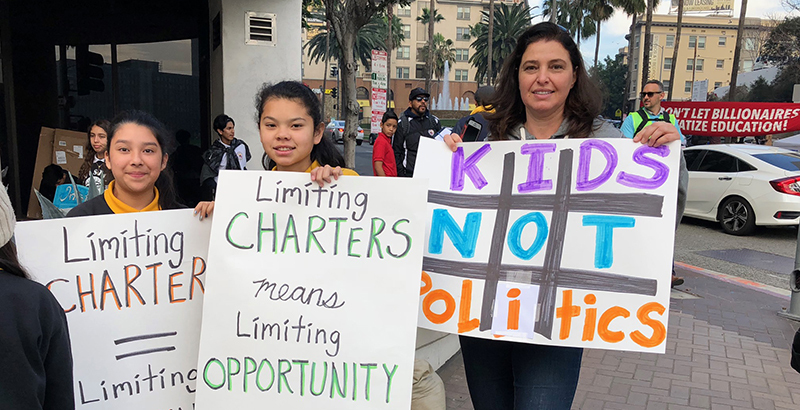 Thousands of parents and supporters turned out to show their support for charter schools ahead of Tuesday’s Los Angeles Unified School board meeting Tuesday. Hours before the meeting was set to begin, parents arrived to rally, urging board members to vote against a resolution calling for a moratorium on new charter schools and asking the state to study their impact on L.A. district schools. Join us as we tell LAUSD #kidsnotpolitics #nocharterban! As many as 4,000 parents cheered and chanted at the district headquarters, according to an estimate from the California Charter Schools Association, which organized the demonstration. They held signs declaring “Kids Not Politics” and “School Choice Now.” L.A. Unified School District police estimated the crowd at 3,500 people, according to an officer at the boardroom entrance. As The 74 reported, the resolution was a part of L.A. Unified and United Teachers Los Angeles’s agreement to end the six-day teacher strike in district schools last week but was not included in the contract. If passed, it would direct the superintendent to pursue a moratorium on new charter schools in the district, and it also would require the school board to call on state officials to study the financial impact of charters on the district to inform revisions to the state’s charter law. Four of the six board members — the majority of whom were elected with charter organization backing — would have to approve it for it to go into effect. The rally included a series of speakers, including teachers, students, and parents who talked about their personal experience with charter schools in the district.